Teachers should teach children not what to think but how to think. At first sight, this statement may sound reasonable but it is in fact false. No one conceives ideas out of nothing. How we think is shaped by what we know. This is especially true when it comes to matters that are controversial or judgmental. How we think is also influenced by how we feel. More importantly, it is shaped by our beliefs. And when it comes to impressionable individuals, especially children, it is often a lot easier to copy how one thinks than to understand or grasp what one actually thinks. Young minds can be easily persuaded or even pressured to accept what adults say. For these reasons, a teacher inside a classroom of students must be careful, thoughtful and considerate since he or she is really in front of a captive and impressionable audience. Critical thinking should remain adherent to facts, but by its very nature, it should not likewise serve a teacher's set of beliefs or agenda. As teachers, we must never impose on young children our own political views. 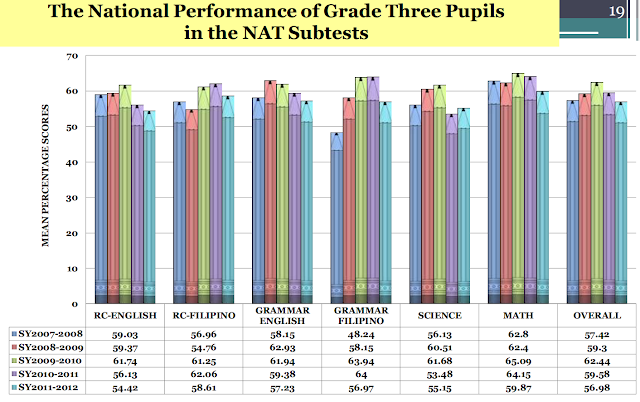 That is why it is disconcerting that a teacher in the Philippines has injected ideological material in a second grade exam. 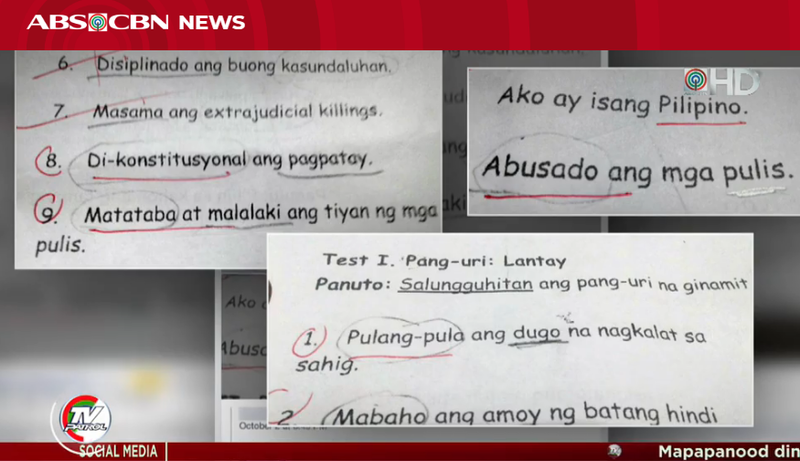 The above are screen shots of an exam in Filipino grammar administered to a second-grade class. The topic is learning about adjectives but the examples chosen for the exam are relaying strong-handed messages. One sentence says, "Matataba at malalaki ang tiyan ng mga pulis" (Policemen have fat bellies). Another sentence says, "Abusado and mga pulis" (Policemen are abusive). It is clearly unnecessary to use statements that deride law enforcers just to provide examples of how adjectives are used in a sentence. Some may defend this as academic freedom. 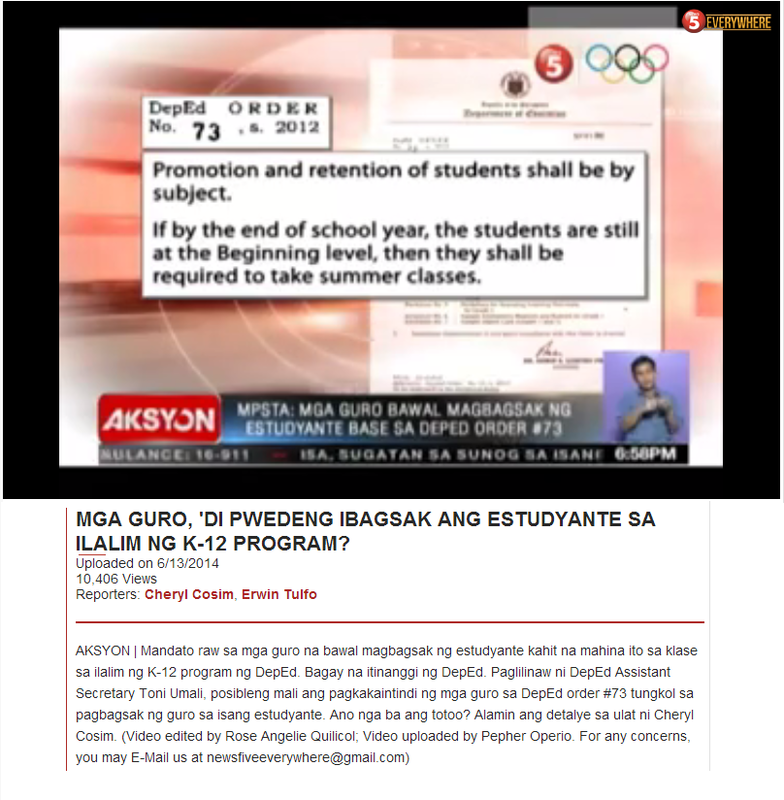 It is true that as academics, we, as teachers, have the right to pursue the truth. But academic freedom does not extend to a right to brainwash young impressionable children.